This song begins with a psychedelic type of groove, and then the guitars go into distortion with a repeating rhythm, for a few bars, then the vocals kick in with lower growls, and a guitar riff where you can sense the metal just seeping its way into the song. The song has progressed from a jazzy groove, to a solid mid paced metal song that maintains a decent groove keeping you moving. Then the song hits the half way point and we get a little bridge of some jazz fusion sound with a guitar solo. The song picks right back up into the metal aspect, and gives us another round of heaviness before the song ends. This song goes right into a drum roll out and into the first verse, the blast beats and the guitar riffs are great, I am really enjoying this song. It has so many personalities to it, and they all fit together well, they aren’t doing too much metal, too much jazz/experimental they walk the fine line of equality between the two styles. This song is 5:55 minutes of interesting metal and unique changes between all the other elements of the song. The way the song progresses from one style to the next is seamless, whether it is immediate or a few bars of one style to the next it works. This song begins with a cool jazzy feel to it, it has a groove you can tap your foot to and it lasts for just over sixty seconds. The metal persona begins right after with the growling vocals and distortion, yet still provides a groove. This is what I am enjoying about this album, no matter what personality the song is active they give you a solid beat that you can tap your foot to, move your head to. This is a fun song to listen to, and the lyrics fit the song very well. The guitar solo around the 3:39 minute mark is a very relaxing and cool solo. Songs like this are so unique in the way that you don’t dare skip, even if you don’t seem to like it, because you don’t know what will be happening next. I happen to really enjoy this song, and am eager to hear the next song. Love the vocals right out of the gate and the rhythm for the first fifteen seconds, and then the rhythm right after is mercilessly driving, the blast beats and the guitar riff. Just when you think you couldn’t be any more impressed, they spring a song like this on you. As I look at the total time of the song, I am curious as to how much talent and charisma they have filled this song with because it is already bursting at the seams with great infectious melodies and a beat that hooks you. The solo is great, they give you a skillful guitar solo that you can’t help but want to listen to again and again. The way the song fades out is absolutely perfect for the structure of the song. The song begins with a slower tempo and a perpetual riff wrapped around a solid beat. This song has some odd timing to make things interesting but only during certain sections. The band really locks in that groove, you can tap your foot to it, and you can still follow through the odd timing. This song is a great listen, it progresses exquisitely and is filled with great guitar riffs and impressive percussion skills. This is song is a warm, progressive jazzy metal hybrid that leaves you feeling good about where you are in that exact moment. I love the guitar riffs, and rhythm. This song is great it has just the right changes being made and keeps the listener interested. This song is just as good as Part 1 if not better, I really dig the way it begins and all of the changes we see throughout this song. The tempo changes, the metal progression, the jazz feel, the blast beats. I mean this song is awesome and the way it ends is really appropriate for the entire album. I give this album an 8/10, it was a solid album, not for everyone, but nevertheless a great album. This is one of those bands that if for me I had never heard before. When listening to a band for the first time you really begin to filter what you heard into two categories; impressive, and not impressive. This album is very impressive. I loved it, they have every change, every riff, and every beat calculated to the right degree and time. If you are looking for something new that you have not hear before, and want something that has a variety of different styles and can pull of some cool solos, has a great metal sound, some stellar progression, and a great jazzy feel. Then you should not waste any more time, just go and check these guys out now and pick up or download the album from their bandcamp site Here! Sorry for any delay to any metal news there is, i happened to take a vacation this past week that included seeing Cryptopsy wrap up their ” Back to the U.S. tour in Syracuse, Ny, and then making my way down to Florida to relax by the beach or pool and read Extremity Retained written by Misery Index’s own Jason Netherton. Needless to say i did not have my computer or wifi so any posts i could do were few and far between and on my phone with only a 1G and maybe if I was lucky 3G/4G service. At any rate lots to report and i still wont be able to fit it all in to one post without everyones ADD needing to look at something different, so i am going to break this up into a few posts just to keep you guys engaged. Parkway drive just released a video yesterday for the song ” Vice Grip” if you are a Parkway fan then be sure to check this out, if not hey maybe you will like them or move along to the next story i have. Heart of a coward, new video released today on Century Medieas youtube channel, they are a bit more mainstream sounding but anyone who listens i bvet you could hear them on either Sirius XM Liquid Metal or Octane easily. Not bad definitely check them out. Slipknot released the video to the song Killpop yesterday and has already broken a million views, 1,381,960 to be exact right now as i am typing this which is a big feat considering it was released yesterday. Shadows fall hiatus is over? Whether or not this is just a one show gig, or if they are going to come back at it full swing its still pretty cool. The band announces summer show at The Big Kahuna Festival in Providence RI Saturday August 22nd. Maybe this will lead up to more band news, maybe it won’t but if you are in the New England area and you are a Shadows Fall fan you may not want to miss this show. Cryptopsy crowdfunding only has 29 days left, and $6,366.00 raised so far click on the link to help them reach their goal! I know I have posted a lot about Cryptopsy, but you have to understand, when they formed years back most of the metal was just the typical death metal. These guys are from Canada and just created a sound like no one else, and still no one can pull off the same sound. I have always been a huge fan of Flo Mounier as a drummer, the guy is just incredible. and also i had the chance to meet and talk to the band at their last show in Syracuse, NY. The guys are some of the most down to earth people, and are all a bunch of great guys who have lives like you and me. 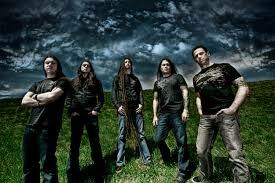 Each had great stuff to talk about with the new album, and also had great ideas for the future music from Cryptopsy. So check out their crowdfunding Indie gogo page, maybe you have never heard their music before, listen to some songs and heck if you dont want to buy a cd buy the digital download, its only $5.00! You can even have exclusives like Matt doing vocals for your band or flow doing drum tracks etc. Other misery Index news the legendary Jason Netherton Bassist and founding member of both Misery Index, and Dying fetus as well as author of Extremity Retained will be presenting at the Modern Heavy Metal Conference in Helsinki Finland. Also if you are a fan of metal, and like me grew up listening to it, do yourself a favor, pick up Jason’s book Extremity Retained. It is a must have for every fan of metal. And of course as I posted yesterday Lamb of God has the audio for the track titled “512” up to listen to. Its not a fast tempo song, its a good mid tempo song that has some powerful background fueling the lyrics. Randy had spoke to Rollingstone magazine and said that his cell number while in prison over seas was 512. So if you have not listened to it yet, get on that. New Lamb of God what are you waiting for? And right now the Video for Killpop has 1,382,160 views and picking up steam. So thats just part of my news cathc up stay tuned for more. and make sure to support local music, and actually buy the music. Bands need to earn a living too. So as I posted before I came across Archspire, and got blown away. SO what do I o when i hear a sick band. Check out videos to find if there are any drum playthroughs videos available. The thing about metal, and the thing about drums. Is that you can have so many different styles. Take Adam Jarvis for example, the guy play the drums for Misery Index, Pig Destroyer, Fulgora, and another band called Asthma Castle. Listen to all of those bands and you will see they are all different styles. so not only are drummers capable of having one style and sound, they can also play different types of music. Some can even play music that could be metal, jazz, hip hop and funk all mixed together like Candiria’s Ken Schalk. So I figured I could show three different styles of video to give you a good idea as to what to expect from Archspires drum tracks for future albums, and Live shows if you see them on tour with Aborted.